In what was perhaps the most impressive week of White Sox baseball all year, the South siders swept the best team in the AL, set aside their traditional woes against the Blue Jays, and came within one terribly-played slugfest on Sunday from a perfect week. For that, they increased their division lead just a single game. Cleveland's offense was buoyed by the return of Travis Hafner, and Tigers cleaned up against the bottom half of the AL Central. Given how long the weakness of the division propped up the Sox playoff hopes as they waded in the murky waters of mediocrity, one might figure their streak of superlative play would produce some breathing room, but that would potentially make the 2nd half easy. That just wouldn't be right. Looking at a week-size sample of the Sox offense is going to look ridiculous. They immolated Roy Oswalt and the RangersMonday in an absurd massacre that didn't seem any more latched to reality even after Chicago finished off the sweep of the Texas juggernaut. The offense put up a .311/.360/.524 batting line for the week, but 40 of their 108 total bases came on Monday. If they actually hit that well the entire week, a 5-1 record might be disappointing. Kevin Youkilis has taken to hitting in Chicago as well as a dog might take to living in a house made of peanut butter, putting up a .347/.418/.571 triple-slash since the trade. Obviously a lot of that performance is just good-old fashioned hot streak, but the increased power and reduced strikeouts since leaving Boston are encouraging. It's helped to cover up for Dunn and Konerko. Neither has become a complete black hole while struggling, but Dunn struck out in eight of his 21 plate appearances on the week, and none of Konerko's six hits went for extra bases. 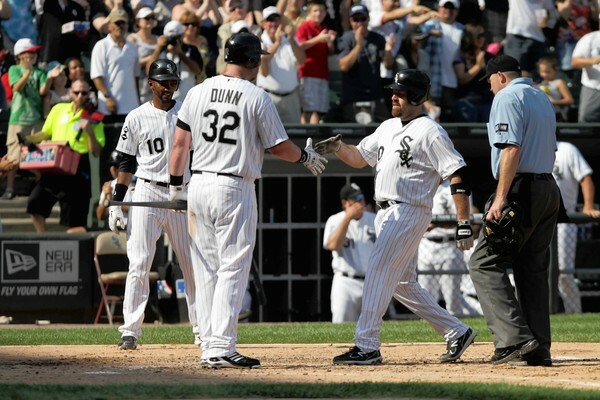 Dunn striking out, and Konerko lacking power are not trends exclusive to this week, either. Obviously they've built up some trust, though. Non-Dylan Axelrod starters for the week: 4 GS, 30.1 IP, 0.89 ERA, 16 H, 6 BB, 22 K, HR. Dylan Axelrod for the week: 2 GS, 8.2 IP, 11.42 ERA, 13 H, 4 BB, 6 K, 4 HR. That paints the picture pretty clearly; the White Sox need John Danks back. And not so that he can come be the staff ace he was never particularly well-suited to be, but simply regular, old, average John Danks. As it stands, the Sox starting rotation is in an odd middle place. If Floyd and Quintana can remain effective, they have two options (Humber and Danks) to restore the last spot in the rotation hopefully coming off the DL in the 2nd half. At this specific moment in time, they're one more injury away from true ugliness. It sure was fun when Matt Thornton led out all the rookie relievers out to the bullpen like little ducklings, especially because most of them were rightly avoided like the plague in any high-leverage situation. Both Thornton and Addison Reed were used for three high-tension appearances each (consecutively, for Reed), and Nate Jones might be the only other reliever Ventura can--and once again, rightly so--remember the name of when the lead is three runs or smaller. They all had superb weeks, which is why they have their roles, but the other youngsters aren't looking worthy of enhanced roles. Deunte Heath came up and was sent down without entering a game, Leyson Septimo came into two LOOGY situations, failed spectacularly, and was immediately pulled each time, and Hector Santiago was hidden until Sunday's game...where he actually did quite well all things considered. Brian Omogrosso so far looks like someone who pitched in the minor leagues for seven years before getting a shot. Get well soon, Jesse Crain. Or get here soon, veteran reliever available for trade. The break allows to the Sox to queue up a gauntlet of Jose Quintana, Jake Peavy, and Chris Sale for the weekend in Kansas City. The Royals response of Bruce Chen, Luke Hochevar, and Luis Mendoza is pretty underwhelming, but all three of these men have flummoxed Sox lineups before. If the Sox want to prove things are going to be different this year, feasting on KC's supply of #4 starters would help.